When picking recipes to make, I always try to choose those with lower salt content. Often, if a recipe does list salt, I usually won't add it (except when I'm making recipes involving yeast). My husband does have heart related health concerns so we try to make healthy choices in the kitchen. Thank goodness for herbs and spices. I love to use them when I cook. They help add flavor and make meals more appealing. One seasoning I reach for again and again is Mrs. Dash Original Blend. I always keep a bottle of this salt-free, natural seasoning in my spice cabinet so I can spice up many of our meals. It is MSG free and contains 14 different herbs and spices. We use it as a salt replacement, and I especially like to use the seasoning on vegetables, in soup and on chicken and fish. The the Mrs. Dash® website (http://www.mrsdash.com) includes many other recipes (mostly low sodium) you can easily browse. There's even Video Recipes and Cooking Videos to watch online. 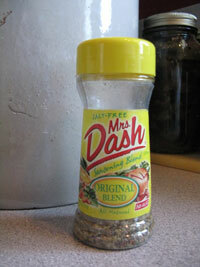 Did you know that there are 15 flavors of Mrs. Dash® Salt-Free Seasoning Blends? They include Original Blend, Garlic & Herb, Table Blend, Extra Spicy, Onion & Herb, Lemon Pepper, Italian Medley, Tomato Basil Garlic, Southwest Chipotle, Steak Grilling Blend, Chicken Grilling Blend, Mesquite Grilling Blend and Hamburger Grilling Blend. Which are your favorite ones to use?